The conference venue building is accessible for people with special needs, however, because the access is specific, we ask everyone who needs special assistance to access the building to contact the organizers. The specific location of sessions inside the building of the Faculty of Science will be added later. Prague is the capital and largest city in Czechia (the Czech Republic), the 14th largest city in the European Union and the historical capital of Bohemia. Situated in the north-west of the country on the Vltava river, the city is home to about 1.3 million people, while its metropolitan area is estimated to have a population of 2.6 million. The city has a temperate climate, with warm summers and chilly winters. Prague has been a political, cultural and economic center of central Europe complete with a rich history. Founded during the Romanesque and flourishing by the Gothic, Renaissance, and Baroque eras, Prague was the capital of the kingdom of Bohemia and the main residence of several Holy Roman Emperors, most notably of Charles IV (1346–1378). It was an important city to the Habsburg Monarchy and Austro-Hungarian Empire. The city played major roles in the Bohemian and Protestant Reformation, the Thirty Years’ War and in 20th-century history as the capital of Czechoslovakia, during both World Wars and the post-war Communist era. Prague is home to a number of famous cultural attractions, many of which survived the violence and destruction of 20th-century Europe. Main attractions include Prague Castle, Charles Bridge, Old Town Square with the Prague astronomical clock, the Jewish Quarter, Petřín hill and Vyšehrad. Since 1992, the extensive historic center of Prague has been included in the UNESCO list of World Heritage Sites. The city has more than ten major museums, along with numerous theaters, galleries, cinemas, and other historical exhibits. An extensive modern public transportation system connects the city. Also, it is home to a wide range of public and private schools, including Charles University in Prague, the oldest university in Central Europe founded in 1348. Prague is very easy to travel around. The city center is well connected with public transport (buses, trams and subways), but you can also use taxy services and UBER. 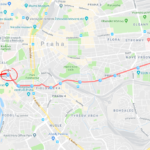 Getting to center from airport: Prague is connected to its airport by buses. See the official website DPP for more information. Ticket fares are based on time for which they are valid. You can buy ticket from 1h of validity to whole week of validity. For fares, check this link on the same page. 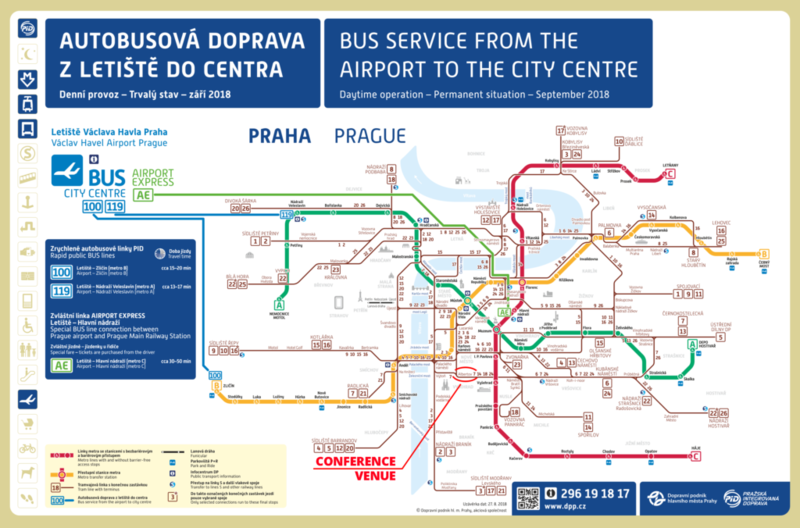 The cheapest option to get to Prague city center is by using regular public transport which is very cost effective. The bus station is right in front of the Terminal 2 (Exit D). A ticket valid for 90 minutes costs €1.25 (32 CZK) and you can use it for the bus, tram or subway. Just take the bus 119 to Nadraží Veleslavín where you must transfer to subway line A (green) and you can continue to downtown (Můstek) or any other station. The bus goes every 6 minutes and operates from 4:23 AM to 23:42 PM (last bus) on all days including the weekend. Alternatively, you can take the bus number 100 which goes to Zličín (yellow subway line B) or bus number 191 which goes to Anděl. Check out the video from Honest Guide guys (the “before you come” bookmark) where it is very well explained. A bit more convenient is Airport Express bus as you don’t need to transfer to the subway to get to the city center, but it’s also slightly more expensive. The bus station is at the parking lot right in front of the Terminal 1. Tickets cost €2.50 (60 CZK) for adults or €1.20 (30 CZK) for children and you can buy them at the terminal or directly from the bus driver. The bus terminates at Prague Main train Station (Praha Hlavni Nadrazi) where you can take a subway (line C), tram or go by foot. Please keep in mind the bus schedule – buses operate every 15 – 30 minutes starting at 5:30 AM to 9 PM. The ride takes around 50 minutes (depending on the traffic) and you can use it also on the way to the airport. Getting to the conference venue: Charles University, specifically its faculty of geography is located in Prague district called Albertov. Closest public transport stop is the tram stop Albertov. The trams for this stop are nr. 7 and nr. 14. The tram nr. 7 has west-east journey, and the tram nr. 14 has north-south direction. They both come both ways. From the center (Wenceslas Square) which is served both by metro (A and B line) and trams, you can take tram nr. 14 to go directly to the tram stop Albertov. 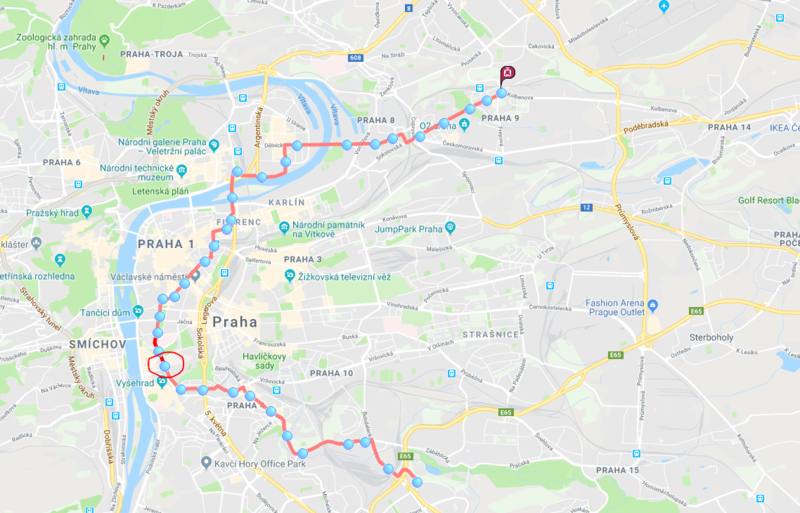 Prague is divided to zones, when it comes to ticket fares – for most of the cases, you are ok with the ticket only for the P or 0 (the center), unless you plan to see the outskirts of the city. The ticket can be bought in the newspaper stalls (trafika), some of the small grocery stores (Žabka), in the subway with the DPP employee and/or in one of the many automated ticket machines. See their description here. Czechia uses its own currency, CZK, called czech Koruna and its value to euro is usually around 1 EUR = 25,6 CZK (03/2018). Beware of money exchange on the streets or in the unsure Exchange stalls, which can give you money of different currency or with unusual exchange rate. See some of the iconic places of Prague bellow.